Since 1937, U.J. Ramelson has combined age-old traditions with advanced technology to provide the best possible product. This commitment to excellence lives on, as a third generation of owners continues crafting the highest quality tools right here in the USA. 5-piece Carving/Draw Knife Set is perfect for all of your chip carving needs. 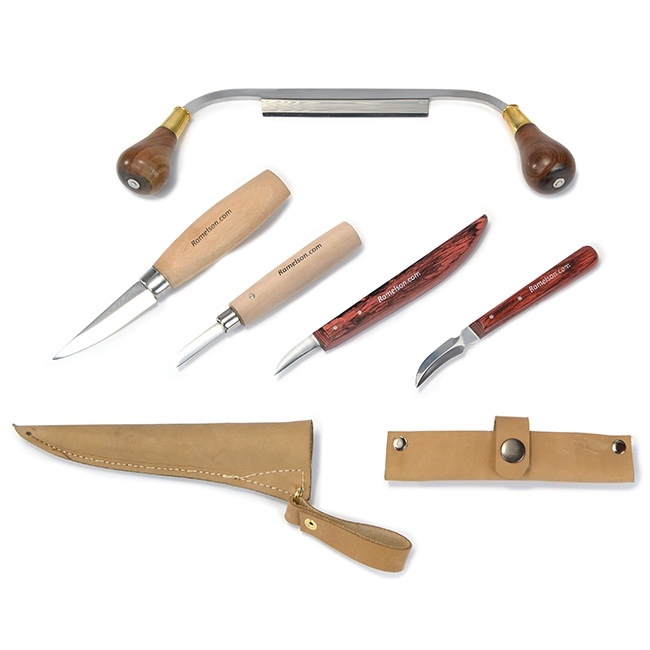 Set includes: beginners bench knife; "Sloyd" carving knife with 2-7/8" blade, 7-1/8" overall; curved blade double-edge whittling knife; round-handle whittling chip knife with 1-1/2" blade and straight cutting edge, 5-1/4" overall; razor sharp draw knife made from 1095 high-carbon tool steel with 4-1/2" cutting blade, rosewood handle with brass ferrules and leather sheath to protect blade.